Arm your Magento store with the extra layer of security to protect it against unauthorized access. Leverage Magento 2 Two-Factor Authentication to safeguard sensitive customer data and your assets. 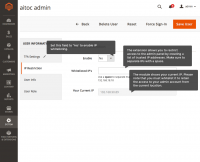 Strictly control access to the admin panel by introducing the second authentication step that involves entering a unique one-time 6-digit password each time users log in to their accounts. With data security and consistency at stake, there is an urgent need for online retailers to protect access to sensitive data with effective means. The two-factor approach enhances user-generated passwords with unique one-time passwords, providing for an additional layer of protection and so making it a lot harder to break into your admin panel. Password reset is one of the most popular helpdesk tickets a website support service have to deal with. Two-factor authentication enables a kind of a self-service that allows system users to get one-time passwords via a secure application, this way putting off the pressure of your support specialists and so reducing operational costs. Thanks to the two-factor authentication, Magento users can securely log in on the website using not only office computers, but also their PCs and mobile devices. This allows store employees and partners to work remotely or access the system on the go, considerably improving the workforce productivity and, consequently, your business performance. 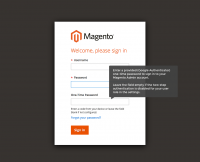 Make the login process secure as never before with Magento 2 Two-Factor Authentication. With the extension, users must enter an additional one-time password to access their accounts. 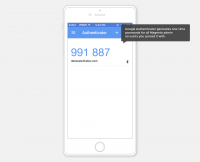 Utilize Google Authenticator, the most reliable authentication solution, to generate one-time passwords. Sync it with the module by entering a secret key or scanning a barcode. 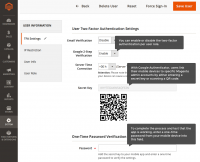 Effortlessly produce one-time passwords with Google Authenticator when you log in to the Magento admin panel. Please note that such passwords are valid for 30 seconds. Mitigate the risk of cybercrime by adding reliable IP addresses to the whitelist. Be sure that only visitors with trustworthy IPs can access the admin panel of your ecommerce store. Request Magento 2 Two-Factor Authentication to send you an email with a one-time password if it is more convenient for you. The extension uses email addresses specified in the User Info. You can choose whether users need to enter one-time passwords. Configure authentication settings for each user individually. Enable and disable the second authentication step. Push Notifications for Magento 2 plugin - Enable web push messages to share current deals with site visitors, encourage them to sign in, notify buyers about an order placement or bring back the customers who just left the website. Dimensional Shipping Box for Magento2 - Optimize your packaging and shipping process. Automatically calculate the total weight and dimensions of ordered goods to pack them in boxes in the most cost-saving manner. Magento 2 Multi Stock extension - Manage multiple warehouses and inventory simultaneously. Split your stock between various web stores and control your inventory levels in the real-time. Magento 2 Checkout Required Fields module - Tailor the standard checkout page to your requirements by managing its fields. Create custom checkout fields and add them to your form to collect actionable information from your buyers. + Added compatibility with Magento Open Source 2.3. I like that i can use email only for two step authentication, this is what i was looking for. we don’t need google app, we need to authenticate via email only without google app. with this extension i can have that option. Simple and lightweight solution, very easy to set up and use. Thanks Aitoc! I found this extension when I was looking for ip whitelisting feature. That's exactly what I prefer to keep my admin panel secure, and the module provides just that. I'm satisfied. I like this solution, it was easy to set up. Aitoc team was kind to help me with my ip whitelisting, although i decided not to use it in the end.